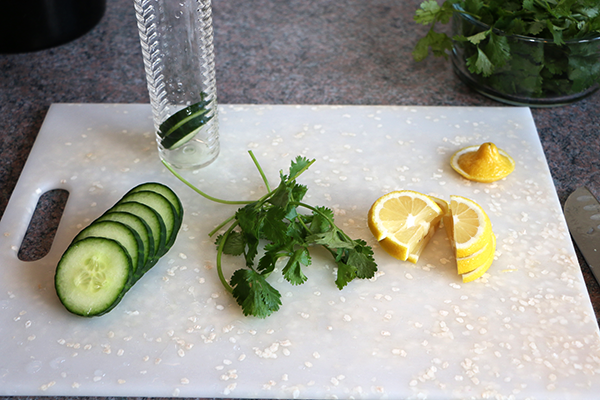 Half of lemon, a few sprigs of cilantro leftover from a recipe, and a cucumber that you need to eat before it goes bad: these are all common ingredients in my fridge and, happily, they make one of the best infused waters ever! This water is very refreshing and has a clean, light taste that reminds me of spring. After exercising, the water is especially hydrating when consumed cold. Infuse for 4-8 hours and serve cold. If you are going to be infusing for longer, remove the lemon rind to prevent bitterness. Cut the top off the lemon; try to include as little white rind as possible. 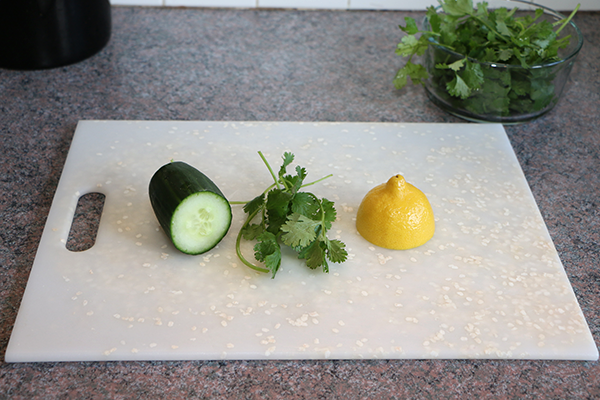 Cut the lemon and cucumber into 1/4″ slices. If using the Prodyne pitcher, you will probably need to cut the slices into half moons. Layer the ingredients in the infusion core and use a blunt tool (I always have a wooden muddler handy and use the back, smooth end of it) to push the ingredients down. You can be rough when inserting the cilantro. If you break the stems and bruise the leaves with your fingers, they will release more flavor. Note: add as much cilantro as you like, up to 10 sprigs if you really enjoy the flavor. Fill the pitcher with water first, then lower the infusion core into it. This method produces less fruit floaters that occur when the fruit is put under rushing water. 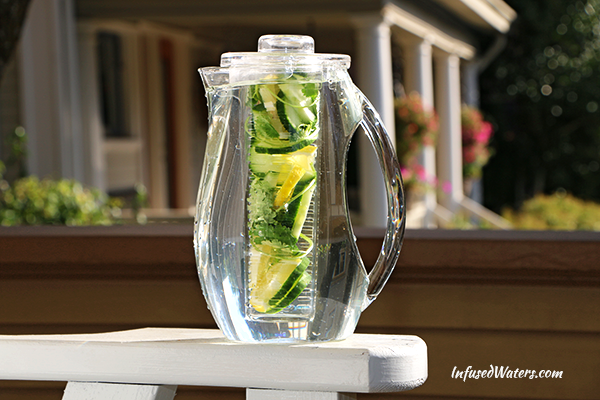 Infuse for up to 8 hours in the fridge for best flavor. The result is one very pretty infused water! 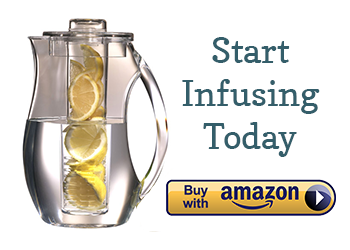 Tip: if you want to get the most of the ingredients, drink half of the water after it has infused, then pour more water into the pitcher and keep infusing. Last tip: if you had cucumber or lemon slices that you could not fit into the infusion core, simply cut a little slice in them and turn them into a garnish. Cheers! 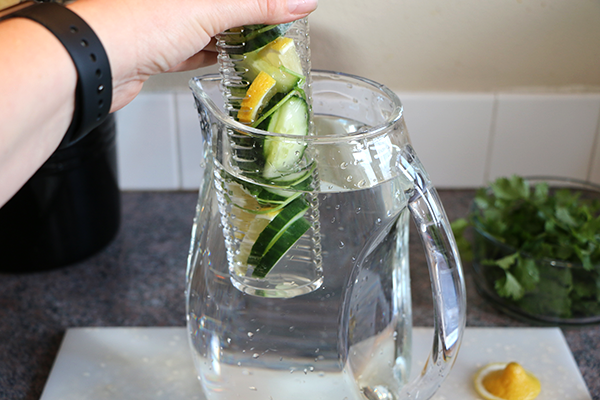 Is there any negative side effects if I drink too much infused water using cucumber and lemon. Usually I drink more or less 3 to 4 liters everyday. Mmm, this is my all time favorite recipe!!! Btw if anyone’s looking for a cheap infuser bottle, eBay has some for under $5!! Granted they aren’t the most durable but for that price who cares! 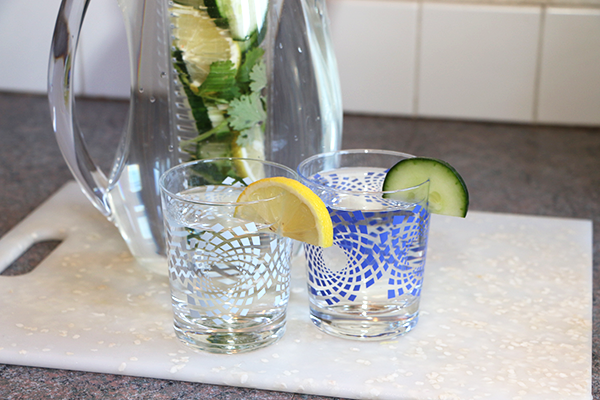 is it better to use a glass pitcher versus a plastic pitcher to infuse water? 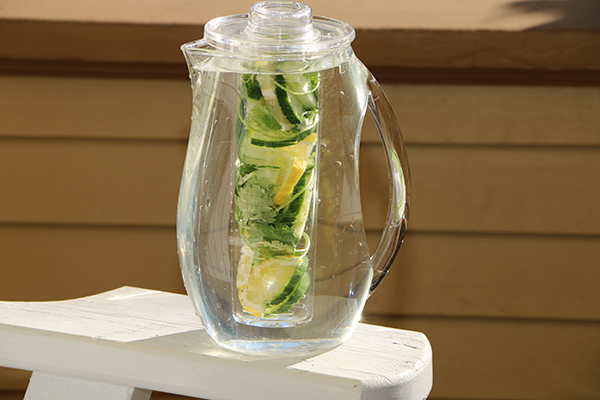 Are any of these infused waters good for losing belly fat ? Can’t wait to introduce this recipe to my weight loss clients. Hi! 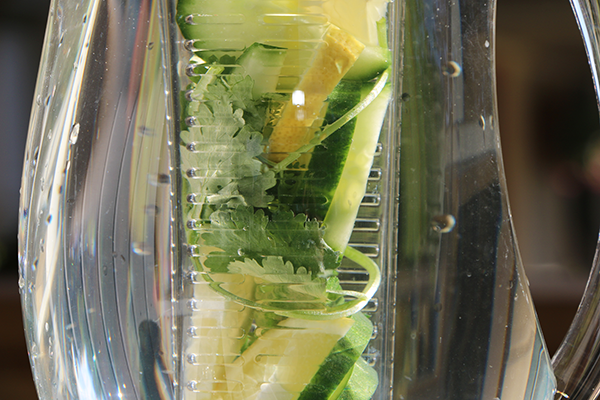 I’ve only started the lemon cucumber water movement, and I was wondering if it’s okay to use 1 lemon and 1/2 cucumber in a tumbler for the day. Is that okay? My pitcher is the opposite-ice goes in the tube fruit goes in the water and I have a question. Can you put flavored extract like orange or essential oils into the water along with the fruit/veggies/herbs?